Israeli settlers from the illegal settlement, Mabo Dothan, built on the land of Yabad, to the southwest of Jenin, Thursday, assaulted a Palestinian taxi driver and hurled stones at Palestinian vehicles.Mohammad Mahmoud from the village of Tura said that a number of Israeli settlers attacked and beat him up after closing down the main military gate at the entrance to Yabad. He said the Israeli army closed the gate and prevented cars from passing through, while settlers hurled stones at vehicles. Mahmoud added that settler attacks where coupled with curses and racist phrases against Arabs. The settlers closed down the main road leading to Yabad from the western side and hid between olive trees. 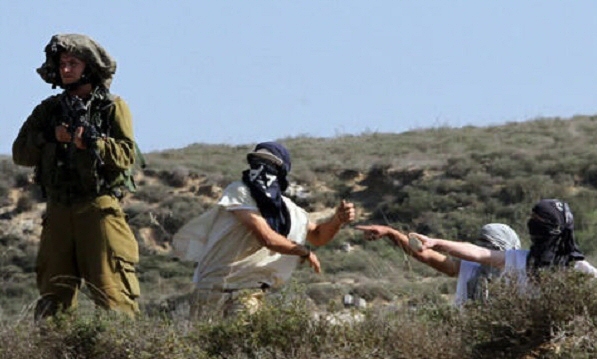 Violence by illegal settlers is commonplace, according to WAFA. They repeatedly attack Palestinian property and places of worship. Israeli human rights organization B’Tselem said that “Israeli civilians have perpetrated various forms of violence against Palestinians in the Occupied Territories, damaging their lands, their persons and their property. B’Tselem has documented many such acts including the blocking of roads, throwing stones at cars and houses, making incursions into Palestinian villages and land, torching fields, uprooting trees, and other damage to property. Settler violence includes property and mosque arsons, stone-throwing, uprooting of crops and olive trees, attacks on vulnerable homes, among others. On July 31, a group of settlers killed 18-month-old Palestinian toddler Ali Dawabsha and seriously injured his entire family, during a predawn arson attack that targeted two homes in the village of Douma, to the south of Nablus. The baby’s father, Sa’ad Dawabsha, his mother Riham and his 4-year-old brother Ahmad sustained third degree burns and were transferred to several hospitals to receive immediate medical care. Reham and Sa’ad died within two months, while Ahmad remains in hospital to receive urgent treatment.